Hello in Chinese | Where learning Chinese is so much fun! Where learning Chinese is so much fun! Don’t forget to download your free study guide. How are you in Chinese is closely linked to the Chinese phrase for hello in Chinese. The Chinese language is quite interesting when you follow some of the connections between Chinese characters or Chinese phrases! Still, you’ll find this video on how are you in Chinese easy to follow. From the video, you’ve gathered that asking how are you is as simple as three Chinese characters, 你好吗? Yet, saying this Chinese phrase with the right Chinese tones is probably the most important part of asking this question. With the tones said properly, though, you’re off to a great start in Mandarin Chinese! 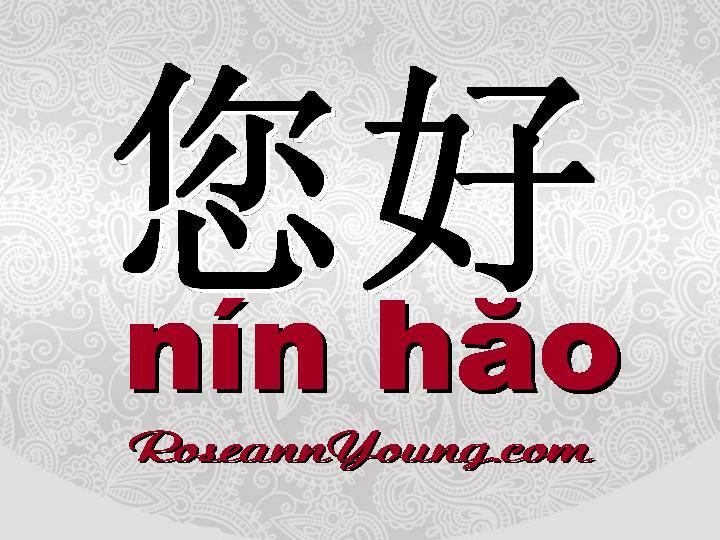 Best to you in saying, “How are you?” in Chinese! For a less formal means of asking how are you in Chinese, you should try 你怎么样? This phrase is used when you already know someone and is closer to asking, “How have you been?” or “How’s it going?” But, if that’s what you’re trying to communicate by asking how are you in Chinese, you should probably use this phrase. Let’s take a closer look at this more familiar Chinese phrase. Now, whether you’re addressing someone you just met with 你好吗? or talking with someone you know pretty well and asking 你怎么样?, you’ll be able to ask, “How are you?” in Chinese properly! If you’re interested in learning how to speak Mandarin Chinese, then a great way to start is to learn the Chinese alphabet. Of course, knowing Chinese tones FIRST really helps, but this will give you a general overview of what it’s like to get acquainted with the Chinese alphabet. The Chinese Alphabet: So What? With these two categories of sounds, you’ll be able to read anything in Chinese PinYin. That means that you can look at any text that has Chinese characters as well as PinYin and be able to read it! It’s like putting on training wheels so that you can navigate anywhere in the Chinese language. Of course, some day you’ll want to take off those training wheels and actually be able to read characters without the Chinese PinYin written below it. But, until that time, the Chinese alphabet is a great help in learning Chinese! If you want to know how to say please in Chinese, take a moment to watch this video that gives the Chinese phrase, the characters, and the PinYin for saying please in Chinese. The common phrase for please in Chinese is 请 (qǐng) said with the falling and rising third tone. This Chinese character usually begins the sentence and is used for making a polite request. There is also another phrase for please in Chinese that’s not used quite as often. When you are pleading with someone or begging them, then you would use 拜托了(bài tuō le) instead. Although you probably won’t hear or use this phrase as often, it still is important to know when you’re in a desperate situation. But, to truly get the most out of this workout, you’ll at least want to take the finals (“vowels”) and say EACH FINAL using all four of the tonal sounds. In this way, you’ll be able to learn a sound and put it to use just as it is normally said in Chinese (with a tone, of course!). Not only that, but this daily routine will ensure that you master both the tones and PinYin, which are the fundamentals of the language. As I practice the finals on all four tones, I decided to call this daily exercise the “PinYin song.” The reason for this is that as you are saying this routine, it truly does sound like a song you are singing! At least, it should if you are saying your tones correctly! The next step after tones is to learn PinYin. If you have at least an idea of how the tones work, you’ll now be able to practice each of the four tones using each sound in PinYin. While this might seem impractical for all the sounds, it is nonetheless, extremely efficient in building your tonal skills if you at least do so with the “vowels” of the language. Let’s get started with a brief overview of the PinYin sounds. First, there are two categories of sounds in PinYin (the initials and finals) which are much like consonants and vowels. The initials are more like the consonants, while the finals are more like the vowels. Initials come at the beginning of a word, thus the designation “initial.” There are 23 initials using the simplest form of PinYin. Not bad, since there are 21 consonants in English. When you consider the finals, however, it might seem a little overwhelming at first. But, an important idea to keep in mind is that even though there are 24 finals (which are much like our vowels), this set of 24 includes many of the combinations of sounds that we use once we combine two or more vowels together. In this way, you’re able to get rid of a lot of the rules for putting vowels together, and simply focus on the 24 sounds. You’ve been introduced to the four tones, but it will be up to you to practice as much as possible so you can master these tones! Of course, you can expect to sound pretty strange at first as you are learning to speak them and will probably make many mistakes as you begin. But the important point is to keep going! As you continue on your journey to learn the language, you’ll find that soon the tones will become like second nature. As you learn new characters, words, and phrases, you’ll find you always need to concentrate on the tones, but once memorized and practiced, you be surprised at how easily they come! (Eventually, the tone–and the word it goes with–becomes ingrained in your mind so much so that it’s difficult to separate the two). You’ve uncovered the basics of tones and are now up to challenge of beginning to learn PinYin which are the spoken sounds of the language. Some like to think of it as the Chinese alphabet or phonetics, but it’s not exactly either. If you’ve ever wondered how to ask a question in Chinese, then join the rest of us who often must pause to figure out whether or not we’re asking it correctly! Indeed, you’ll find that asking questions in Chinese is actually easier than in English. It is, however, something you need to get used to in order to do well. In English, you can start with the question like, “What is her name?” When you answer this in English, you have to reorder the sentence by beginning with the end in stating, “Her name is ________.” In this case, to properly answer the question, you are required to reorder the sentence pattern. Next, we’ll examine these questions in light of Chinese grammar. How was it rearranging the above questions? (The statements related to these questions will help you in properly ordering the question). To get the answers to these questions, click here. What is Elderly in Chinese? “Lăo” is the character used to express old (as in elderly). Notice that in Chinese culture, the elderly are highly respected. Therefore, you will also find related terms to hold a good connotation (like the word used for “old friends”). “Lăo” is also used for teacher and master. However, there are numerous words formed with this character.